Choir Riser Platforms for rent from Stage CMDR, Inc. in Sacramento. With all the different size and height options available in Stage CMDR’s rental inventory, any configuration can be achieved when assembling choir riser platforms. Do you already own or have available to you choir platforms but need to increase the over all size or add more tiers? No problem! You can rent more platforms from Stage CMDR. With a single 4×8 deck weight load rating of 4600lbs., thats equivilant to putting 23 choir performers that each weigh 200lbs. on 1 single deck if they could all fit. There is no way you could max out the weight load rating by putting to many people on the platform at one time. 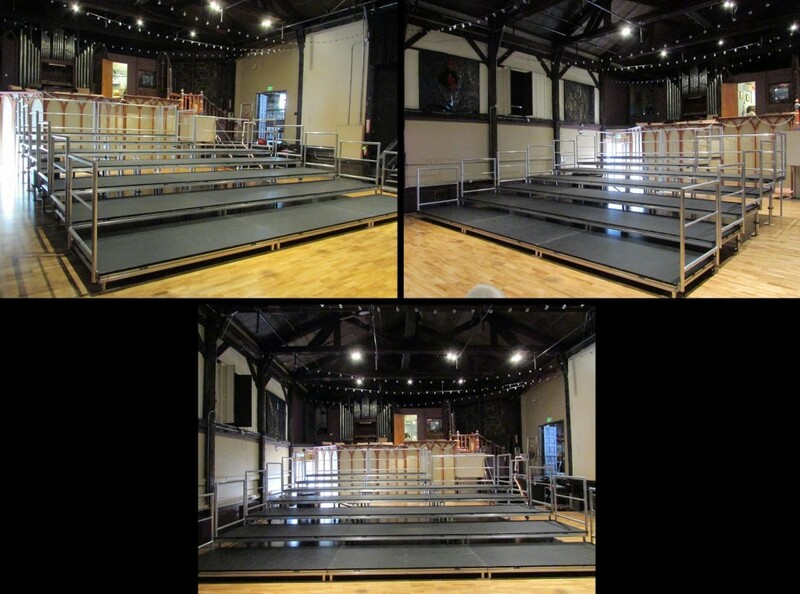 A 32×12, 3 tier platform with black scenic handrails used to add to the tiered platforms on the stage the venue owned. A 40×20, 3 tier platform. Please note that the 8×8 carpeted platform next to the stairs is NOT Stage CMDR’s platforms. That was a venue owned platform which allows you to see the difference of a platform provided compared to Stage CMDR’s platforms. A tiered platform used for a photo shoot. A 7 tiered, 24×28 platform with silver hand rails on 3 sides. A 3 tiered, 24×12 platform with black hand rails on 3 sides.